Here's the bottom line, so far as many market mavens are concerned: Facebook (ticker:FB) continues to prove its social net worth, while Apple (APPL) is a victim of its own success. The stock picture emerges crisper than a retina display in the light of last week's quarterly earnings reports for the end of 2015. Bolstered by a surge in mobile ad sales, Facebook posted earnings of 79 cents a share on revenue of $5.84 billion. That easily beat – nay, pummeled – Wall Street's rosiest projections. "The Street had the highest estimate of 75 cents and revenue of $5.67 billion," says Russ Zalatimo, managing partner of HudsonPoint Capital in Edison, New Jersey. "For the full year 2015, Facebook said their revenues were $17.93 billion, an increase of 44 percent year over year. This growth might be what compels some investors to consider getting involved." Many already have. FB stock was up a stirring 15 percent last week. At the same time, Apple now finds itself in the unprecedented position of beating back iPhone fatigue. In last week's earnings report, AAPL posted quarterly revenue of $75.9 billion and recorded net income of $18.4 billion, or $3.28 per diluted share. Those numbers beat what Wall Street expected in terms of earnings, but fell short on the income side. Perhaps more telling, Apple fell short on quarterly sales of both its iPhone and iPad products. That perceived weakness sent AAPL stock plummeting 6 percent, and Apple lost a staggering $37 billion of market capitalization in a day. "Wall Street was disappointed with iPhone sales, and more analysts are now viewing the company as too dependent on that product," says Robert Barone, co-founder of Universal Value Advisors in Reno, Nevada and a former professor of finance at the University of Nevada. And the quarter ahead will likely mark a first: An iPhone sales slump. "We do think that iPhone units will decline in the quarter," Apple CEO Tim Cook told analysts – this in response to a question about a possible 15 to 20 percent unit decline in iPhones sales for the second quarter of 2016. Fifteen to 20 percent? Ouch. Zuckerberg's golden touch. It's worth considering whether a CEO beauty contest could be driving 2016's first round of irrational exuberance. In Facebook founder Mark Zuckerberg, some market watchers see a youthful, steady CEO who, as a millennial, has his finger firm on the pulse of high-tech's future. To some extent, that reputation has been earned. Facebook's Oculus property stands to turn into a barnburner once the Rift, a virtual reality headset aimed at gamers, releases sometime around March. Additionally, Instagram now has more than 400 million active users – an amount that surpasses Twitter's (TWTR) tally of roughly 320 million. In retrospect, the cool $1 billion Facebook paid for it in 2012 was "a bargain-basement price," Barone says. He adds that "Facebook has become very trendy among investors, more so now that they beat the pants off of Wall Street expectations and that Zuckerberg's instincts, so far, have proved to be the correct ones." Lack of sexiness could well hurt Apple in the years ahead: Excitement translates to sales, which translates to revenue, which translates to higher stock prices. But for the near future, at least, significant stock gains appear not to be in the cards. Apple CFO Luca Maestri acknowledged last week that "revenue would be down between 5 and 10 percent … the March quarter faces the most difficult year-over-year compare relative to the rest of the year." Which stock is better? 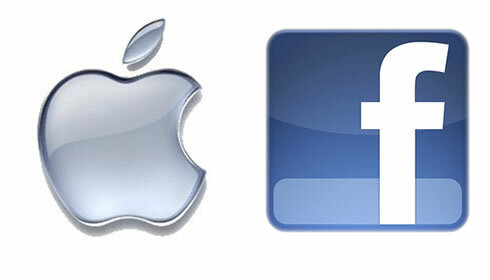 FB or AAPL? "It's almost neat how you can do the math," says Chris Cordaro, chief investment officer of RegentAtlantic Capital in Morristown, New Jersey. "For every $100 of stock that I buy in Apple, I get $10 in profit. For every $100 of Facebook stock I buy, I get $1 in profit. Without a doubt. I'm on Apple and Facebook every day. But as far as where do I want to put my money? It's going to take Facebook a long time before it gets as profitable as Apple." Zalatimo also points to one possible Facebook blip: "Looking at the price-to-earnings ratio alone of 95 could suggest an overvalued situation." Compare that to Apple stock, which carries a pretty low P/E of 10.3. Cordaro thinks market skepticism over Apple's future is misplaced, especially if investors consider defecting to Facebook: "They don't know how to make money off Messenger and they have said that. They're just going to keep increasing their user base and figure it out all later. The risk in buying Apple stock is so much less." Regardless, who could've foreseen the present circumstances in late 2012? Back then, Facebook's initial public offering had all the appeal of a compost heap while Apple couldn't print money fast enough, thanks in large part to the launch of its much-lauded iPhone 5. Now look. One zippy earnings report and presto! – Zuckerberg becomes the sixth-wealthiest person on the planet. Now he's richer than either of the Koch Brothers. Richer than Donald Trump and Trump's renegade hairdo. Richer than Liechtenstein's GDP. Not bad for a 31-year-old Harvard dropout.